Polyethylene pipe is the total piping system that customers count on for predictable quality and proven reliability. It's leak-proof feature is just one of the reasons that polyethylene pipe is the right solution for all types of applications. 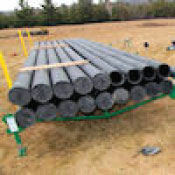 Chemically inert, light weight, corrosion and abrasion resistant plus the flexibility of a pipe that will deflect rather than crack under stress are all advantages that have made HDPE the standard for critical gas distribution.